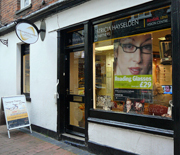 New glasses can make an enormous impact on how you look – as much as a new hairstyle or clothes. They are no longer just an aid to help you see clearly; they can be a fashion statement, reflect your personality, and enhance your looks too. We believe that how you see is as important as how you look and we understand that, with hundreds of styles to choose from, choosing new eyewear can be daunting. It can be difficult to narrow down what really suits and works for you, even if you enjoy buying frames. The breadth of our range means we’re more likely to help you find a quality frame that suits you and your pocket.